Now in it's third year, the annual Mark Scheifele Hockey Camp was held at Bell MTS Iceplex over the course of two days this past weekend. Coming off a fantastic year that started early in September with participation at the 2016 World Cup of Hockey as a member of Team North America, Mark Scheifele can teach a thing or two when it comes to hockey. The native of Kitchener, Ont. posted NHL career highs this season with 32 goals, 50 assists, and 82 points. He put a bow on an extended season by proceeding to help Team Canada earn silver at the World Hockey Championship with eight points (3-5—8). Over 200 participants, ages five to twelve, got to skate and play alongside Scheifele at the camp, including a host of other Winnipeg Jets players, including Michael Hutchinson, Josh Morrissey, and Jack Roslovic - just to name a few. With proceeds being donated to KidSport Winnpeg, funds raised will help families in need of financial resources put their children in organized sports. The event is the perfect marriage of giving back while providing a memorable opportunity for participating youngsters to learn from those that inspire them on the ice. 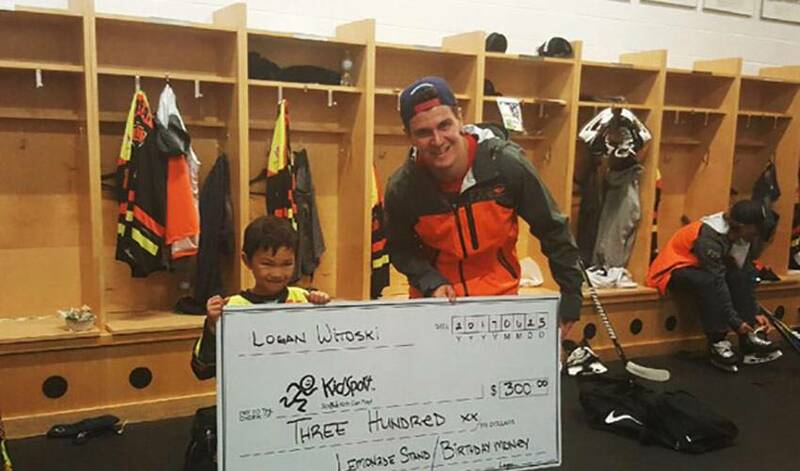 One participant named Logan, however, turned the tables to serve as an inspiration himself to Scheifele. But #Scheifs4Kids didn't end there. "I was a kid that loved every sport. Sports made me the person that I am," Scheifele told media. "Obviously, it’s tough to see a kid unable to play sports because of financial reasons, so being able to give so many kids that opportunity to play sports is really big for me." Also in it's third year is the Mark Scheifele Golf Classic, which was held Monday. Participants had the opportunity to not only enjoy a beautiful day of golf at Niakwa Country Club, but also bid on a plethora of hockey memorabilia through both live and silent auctions that ranged from game-worn jerseys to a Teemu Selanne signed seat from Winnipeg Arena. By the end of the day, the auctions alone had raised $58,895 for KidSport Winnipeg to add to the approximate $215,000 raised from the tournament's two previous years. With each year getting incrementally stronger than the next for Scheifele, both his on and off-ice contributions are looking bright for next season.